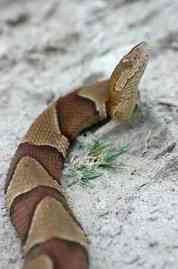 The Copperhead or water moccasin (Agkistrodon contortrix) is a venomous snake species endemic to North America. It is a member of the Crotalinae subfamily, the pit vipers, and 5 subspecies are currently recognized. The snake gets its name because of the copper-like coloration present on its head. These snakes are found in the United States and in northern Mexico. In the USA they are found in the states of Alabama, Arkansas, Florida, Georgia, Illinois, Connecticut, Delaware, Indiana, Iowa, Kansas, Kentucky, Louisiana, Ohio, Mississippi, Missouri, Oklahoma, Maryland, Massachusetts, New Jersey, New York, North Carolina, Tennessee, Texas, Pennsylvania, South Carolina, Virginia and West Virginia. In Mexico, it occurs in Coahuila and Chihuahua regions. Within its extensive range, the copperhead inhabits a variety of different terrains. In North America it favors mainly mixed woodlands or deciduous forest, it's often found in rock outcroppings and ledges but also in the low-lying swampy regions. However, in the states surrounding the Gulf of Mexico, they can also be found in coniferous forest. Whereas in the Chihuahuan Desert of west Texas and northern Mexico, the species occurs in riparian habitats, preferably near permanent or semipermanent water sources and sometimes in dry arroyos. The species is also known by many other common names some of these are the chunk head, highland moccasin, water moccasin, swamp moccasin, black moccasin pilot snake, poplar leaf, red oak, red snake, white oak snake, cantil cobrizo in Spanish. These are medium-sized snakes, an adult specimen of the several subspecies of copperhead snakes usually grow to a total length of 20 to 37 inches (50–95 cm). Although some snakes may exceed 3,3 feet (1 m) in length, but any snake even approaching this length is considered quite large for this species. The males are usually larger than females. They have a relatively stout and muscular body and the head is broad and distinct from the neck. Their color pattern consists of a pale tan to a pinkish tan ground color, overlaid with a series of 10 to 18 light tan to pinkish tan to pale brown crossbands. They have keeled (ridged) scales. Just like all pit vipers, the copperhead is mostly an ambush predator, taking up a suitable position and waiting for their prey. But foraging does occur when these snakes feed on insects like caterpillars and freshly molted cicadas, in this case, they actively pursue their prey. They can climb into low bushes or trees hunting for prey or to bask in the sun and are also capable of swimming. In the southern parts of the United States, the species is nocturnal during the hot summer months, but they are commonly active during the day during the spring and fall time. During the winter the copperhead hibernates in communal dens or limestone crevices, often together with timber rattlesnakes (Crotalus horridus) and Western rat snakes (Pantherophis obsoletus). The snakes often return to the same den every year. Copperheads are social snakes and can be found close to one another sunning, denning, courting and mating, eating or drinking sites. The species is thought to migrate in late spring to the summer feeding territories and return from this migration in early autumn. Southern copperhead - In the US, in the lower Mississippi Valley and also the border states of the Gulf of Mexico, from eastern Texas and southeastern Oklahoma to southern Illinois and on the South Atlantic Coastal Plain from South Carolina to the Florida panhandle. Osage copperhead - Found in the US, in a large part of Missouri, eastern Kansas, and extreme southeastern Nebraska. Broad-banded copperhead -Found in the United States, from south-central Texas, north through central Oklahoma to the extreme south Kansas. Trans-Pecos copperhead - Found in the US region of western Texas in the vicinity of the Pecos and Devils Rivers and in Mexico in northern Chihuahua and Coahuila regions. Much like the majority of North American vipers, the copperhead prefers to avoid human contact, and if given the opportunity it will leave without biting. But unlike other viperid species these snakes will often "freeze" instead of slithering away, and as a result, many bites occur from people unknowingly stepping on or near the snake. For these reasons, they have the distinction of biting more people in the United States than any other snake species. Even though copperheads are venomous, they are generally not aggressive and their bites are rarely fatal. This happens because copperheads often employ a sort of "warning bite" when stepped on or agitated. In this case, the snake injects a very small amount of venom or none at all, a dry bite is particularly common with the copperhead snake. Tests conducted on mice show that their venom potency is among the lowest of all pit vipers, and an estimated lethal dose is around 100 mg. The venom is also weaker than that of its close relative, the cottonmouth (Agkistrodon piscivorus). The copperhead feeds mainly on mice and other small rodents, and play a major role in keeping the rodent population under control. The species also enjoys eating birds, other small snakes, lizards, frogs, salamanders and large insects especially cicadas and large caterpillars. The young copperheads eat mostly insects, especially caterpillars, using a behavior called caudal luring. Copperheads are mostly ambush predators that sit and wait to attack their prey, however they sometimes actively hunt using their heat-sensing pits to find prey. When they attack large prey, the copperhead bites the prey, and releases it so the venom can work, and then track down the prey once it has died. They will usually hold smaller prey in their mouths until it dies. The copperhead snake reaches sexual maturity at around 4 years or about 2 feet in length. The copperhead's mating season lasts from February to May and from late August to October. However the females don't breed every year, sometimes they produce young for several years running, and then not breed at all for a period. The males may engage in ritualistic combat of body-shoving contests, when in the presence of a receptive female.The winner may also have to fight the disputed female for the right to reproduce. These snakes are ovoviviparous, which means that eggs incubate inside the female's body and the young are born live. The female gives birth anywhere from 2 to 18 live young in late summer or fall.The baby copperheads measure 8 to 10 inches (20 to 25 cm) long and are born with both fangs and venom as potent as an adult copperhead. The young copperheads are very similar to the adults with a lighter color pattern, and a yellow-marked tip to the tail, which they use to lure lizards and frogs. The copperhead snake is classified as Least Concern on the IUCN Red List of Threatened Species, due to the species wide distribution, and presumed large population numbers. The population trend was stable when last assessed in 2007 and it's unlikely to be declining fast enough to qualify for a more threatened category listing. It is listed in the state of Massachusetts as an endangered species. Beside the longest fangs the gaboon viper as also the largest venom glands of any snake.